Newark Town Hall has housed the Mayor and the Town Council since it was built in 1776 by John Carr of York. The Grade I listed building is now recognised as one of the finest Georgian town halls in the country. The Assembly Room was designed to be used as the Borough Law Court, as well as used for public meetings, dances and concerts. 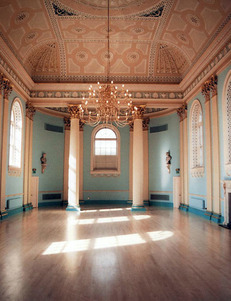 During the renovation of the Town Hall in the late 1980s, the Assembly Room was redecorated and restored to its original 18th Century splendour. In 1993, the restoration was awarded a Europa Nostra Diploma of Merit. In 1999, Newark Town Council opened up a museum within the building to allow daily access to its treasures. In addition to the rooms with displays on the first floor, visitors can enjoy an excellent Fine Art Gallery, the Spotlight Gallery and a Civic Gallery on the second floor.